We are happy to send you the latest updates about the 10th Exhibition and Forum on Energy Efficiency & Renewable Energy. This event will gather all players in the energy sector in Bulgaria and neighboring countries which will have an opportunity to initiate new partnerships, to start new projects and to become acquainted with the latest energy developments. In present newsletter we have picked out some of our exhibitors, working in different areas of alternative energy spectrum. Which companies are included in CPM - California Pellet Mill and what are the benefits of this group? Oil seed, animal feed, solid biofuels, sugar. Make a short overview of your products and which of them you will present at EE & RE Exhibition? What are the advantages of your machine in terms of price, quality and efficiency? Who are your potential customers that you would like to meet at your stand and do you search for a representative for Bulgaria and neighboring countries? We are mainly hoping to meet customers who want to produce fuel or animal feed pellets or companies who build complete plants for the production of pellets. CPM-Europe has developed a revolutionary oil-based lubrication system for the rollers of the pellet mill. Tell us more about it. Producing wood pellets puts a lot of load on the main wear items in a pellet mill, being the rollers and the die. With special materials and production methods dies have been made stronger and longer lasting, thus reducing costs. For the rollers the bearing load is fairly high, requiring continuous lubrication. In most cases this is done with high quality and expensive grease which is disposed after use. The new system developed by CPM has an oil lubrication and cooling system which allow the oil to recirculate. This strongly reduces the cost of lubricants and really increases bearing life all with the aim to lower the production costs and improve the reliability of the equipment. Do you plan to introduce some new products in the nearest future? The extensive R&D teams in the US and Europe are always working on new solutions to reduce costs and improve efficiency. In the recent decades CPM has always taken the lead with new developments. So I expect the same for the future. FILKAB JSCo. is a leading provider of cables and accessories, lighting equipment, electrical equipment and automation devices. What pаrt does the "Renewable Energy Sources" division take up in your business? In 2013 25% of the services and products of FILKAB were realized by the RES division of the company and these include design and installation of photovoltaic systems, monitoring, maintenance service and delivery of materials. Please, tell us about your accomplished projects in the field of photovoltaics. In the past year we expanded our operations outside the country, implementing several projects in neighboring countries and thus we won recognition as a reliable partner in the design and construction of photovoltaic parks. In November 2013 we completed in Romania, Giurgiu County, two sites - PPP Uzunu with 1 MW power and PPP Remus with installed capacity of 2.16 MW. In December 2013 we put into operation a photovoltaic park in Cyprus in the village of Avgoru, Amohostos municipality, with 1,5 MW power, and a PPP Dubrovo in Macedonia with installed capacity of 1 MW. Our investment for the park in Macedonia is one of the biggest investments in the country for 2013. FILKAB has also completed projects in Greece. Thus we gained considerable experience in building turnkey photovoltaic plants, as well as, in providingsubsequent maintenance and warranty service. The simultaneously offered supply and engineering services make the company a preferred partner by the investors in the renewable energy sector, both inside and outside of Bulgaria. In our country we implemented a number of projects in the field of systems for autonomous power supply and for emergency power supply - in "Delta Hill", Kladnitsa, Pernik Municipality; in Lozen, near Sofia; in Svejen, Brezovo municipality and others. FILKAB participated several years in the exhibition ‘Energy Efficiency and Renewable Energy’. What motivates you again to become part of the 2014 editionand do you see any positive market trends in South - East Europe? The Exhibition on Energy Efficiency and Renewable Energy is the largest of its kind in Bulgaria. As a company with a considerable experience in this field, it is essential for FILKAB to attend the forum each year. This enables us to make face-to-face and beneficial contacts with people and companies who are interested in the topic. Through our participation in the specialized exhibition for renewable energy in Bulgaria, we aim at developing our activities in the construction of small industrial and residential rooftop PV systems and solar island and hybrid systems for the customers’ own consumption. Furthermore, we aim not only to present our products and services, but also to get informed about the current market trends and best practices in the world, to exchange ideas and to seek opportunities for joint projects with local and international companies. As for the trends in the renewable energy market in Southeast Europe, we expect Greece and Romania to make a significant growth in their investments in this sector, followed by Turkey, Slovenia and Bulgaria. FILKAB continues to seek and strengthen contacts with companies and investors from the Region and we have already planned several large international projects for 2014. What products will you present and what customers would you like to contact? This year at the exhibition we will focus on presenting the construction of small residential and industrial roof PV systems and PV island and hybrid systems for own consumption. • Implementation of PV projects in Turkey, Poland, Romania, Greece, contacts with local branch organizations, subcontractors and investors. Do you plan to introduce new products in your portfolio? FILKAB constantly strives to expand its product portfolio. Each year we establish a lot of contacts with manufacturers of quality and innovative products that are not present on the Bulgarian market. This allows us to offer our customers complete solutions, regardless of the complexity of the problems they may have. This year we will focus our efforts on the development of intelligent systems for storing energy, produced from RES, systems for increased private consumption and others. NIBE Energy Systems presented by Termopompeni Sistemi Ltd.
NIBE Energy Systems is a market leader for heat pumps in Europe and one of Europe’s major manufacturers of water heaters and other energy-efficient products for heating and cooling that are set apart by their distinctive eco-friendly features. The mission of NIBE Energy Systems is to supply homes and other buildings with products that provide domestic hot water and ensure a comfortable indoor climate. Over the years the range has developed from fairly basic heating products to hi-tech solutions for heating, cooling, ventilation and heat recovery. 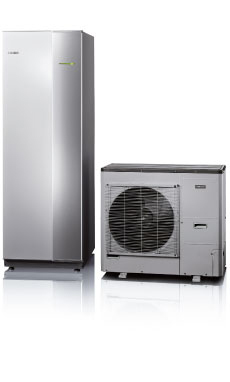 NIBE Energy Systems has a wide range of energy-efficient products that enable end-users in single-family and multi-family properties to choose a solution that best suits their needs with regard to indoor climate comfort and hot water. 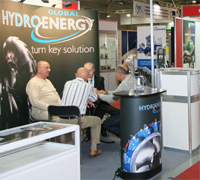 Global Hydro Energy has joined the Austrian Pavilion. It is a young, dynamic company that operates worldwide in the hydro power technology sector and offers its customers the advantages of a flexible and innovative provider with international project experience acquired through global export activities. - Small hydro power plants up to a maximum of 15 MW "water- to-wire"
Solar International is a global title dedicated to news, reviews, technical research and commercial information relating to solar PV manufacturing. Read by senior management including, CEO, Financial, Chief Engineer, in charge of all parts of the value chain from materials, equipment, metrology, automation, BOS, to end device, the module. Emphasis is placed on information which will improve the process and offer solutions to current challenges that negatively affect cell and module manufacturing. Organizer of the international Solar Industry Awards and publishers of Solar UK, Solar MENA and Solar China (Mandarin). European Energy Innovation is published by Prologue Media. It is a communication platform designed with one purpose: to put energy stakeholders in touch with each other. Our quarterly publication European Energy Innovation provides a stream of high quality, well-written informative articles that will keep you up to date with the latest thinking on energy - whether you are from the European Commission, the European Parliament, Academia or Industry. European Energy Intelligence is a media’s online monitoring service, offers subscribers a signpost for future developments. Subscribers can anticipate the impact of political and legislative developments coming out of Brussels months and even years before they happen. Bioenergy International is the world’s most widely read biomass-to-energy magazine. It strives to provide a comprehensive overview of who is doing what around the world giving priority to on-site coverage. News and information is currently published 7 times a year with a print run of 6 000 copies per issue, minimum. It is currently distributed to subscribers and other stakeholders in 66 countries, both as a printed magazine and as an interactive online PDF-file, complemented with other social media such as Twitter.